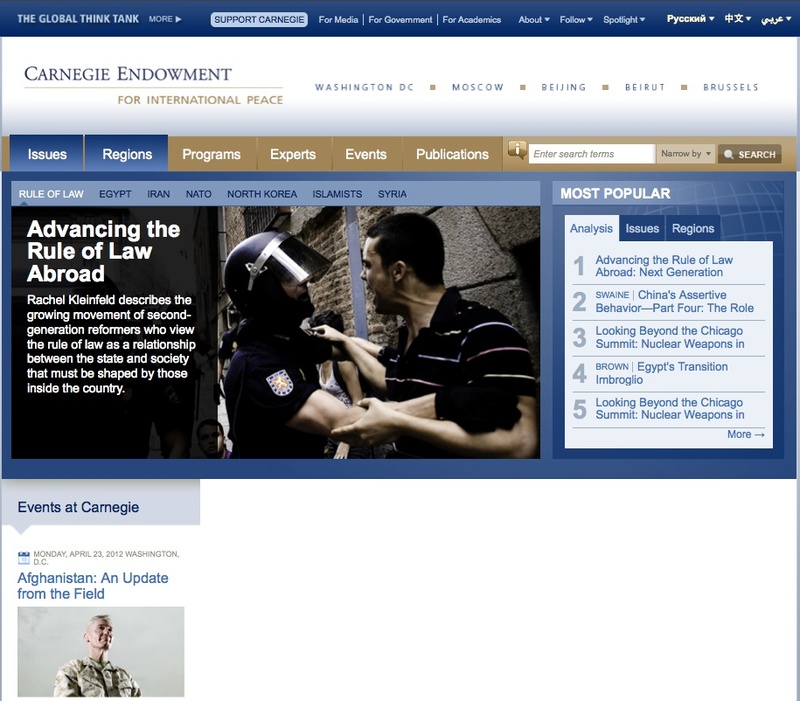 Founded in 1910, The Carnegie Endowment for International Peace is a private, nonprofit organization dedicated to advancing cooperation between nations and promoting active international engagement by the United States. Dealing with a full range of activities related to international politics, economics and cooperation, its work is dedicated to achieving practical results through research, publishing and, on occasion, creating new institutions and international networks. Carnegie Endowment research and materials support professors, students, librarians, and anyone doing research on international affairs. The site offers free access to books for course adoption, with tables of contents and sample chapters, as well as Carnegie papers, rich-in-text commentaries, policy analysis and press releases, in addition to a well classified library of selected online sources (such as The Carnegie Moscow Center and The Carnegie-Tsinghua). The entire project and content is managed by a professional team which does a great job in displaying a whole range of data in a comprehensive and clear way. Containing a huge amount of material (including some in Chinese and Arabic), the site’s design is clearly focused on tailoring the user’s needs.